I was up early this morning and was on the road at 7:45 a.m. I had hitched up the trailer to the truck last night, so all that was left to do this morning was tl pull the wheel chocks, unplug and stow the power cord, and connect the power line to the truck. It seemed good to get back on the road again. My feet were itching to go after sitting still for an entire month! I drove a little over 300 miles today and arrived at Leasburg Dam State Park in Radium Springs, New Mexico just north of Las Cruces by mid-afternoon. I took it easy driving and stopped frequently to walk and stretch my back. It was pretty tight and sore but not terribly painful so I was able to manage just fine. I also changed time zones advancing an hour so I'm back on Central time. 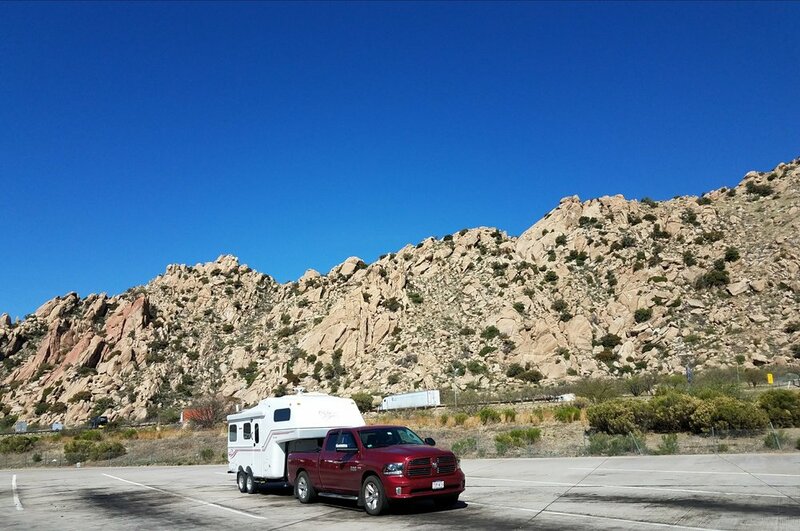 I have a lovely pull through camp site with a gorgeous view of the desert on my passenger side and out the front of my camper. On the driver side I have a neighbor across a wide road and behind me I have a quiet neighbor that's about 75 feet away. I love this park! It's peaceful and quiet with beautiful scenery and lots of wildlife. 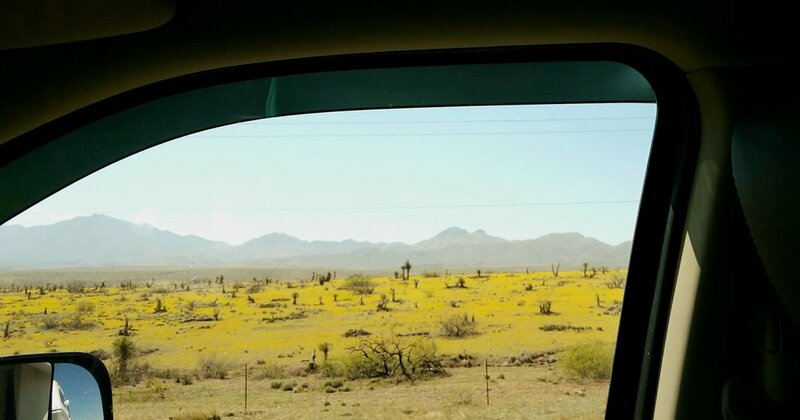 Spring has come to the desert and I noticed a big difference in the landscape as I drove along today there were vast fields of yellow that I couldn't identify but managed to snap a quick picture out the window using voice command. 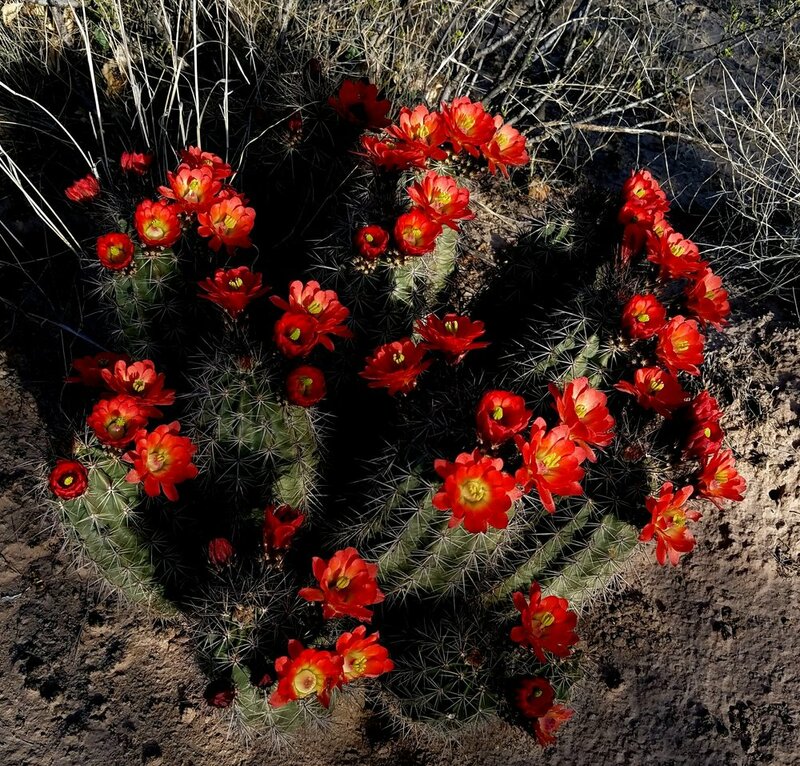 The landscape is becoming green as both cactus, trees, grass, and flowering bushes put forth their leaves and flowers. I passed large cultivated fields of onions, which I could identify , and other vast green fields of crops which I could not identify as I whizzed by. The trees in the large pecan groves near Las Cruces are beginning to sprout their green leaves. Everywhere I look the landscape is coming to life. 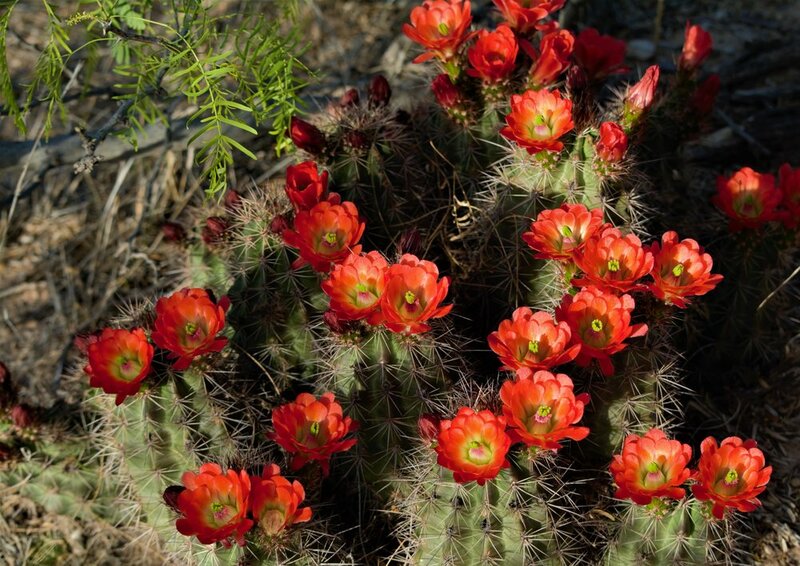 Dexter and I took a short walk after we arrived at the park and enjoyed seeing these beautiful Claret Cup Hedgehog Cactus blooming all around the desert floor. The Desert Willow is also beginning to sprout yellow flowers and the soap tree Yucca have huge white flowering heads. It was still pretty warm and the sun was high so Dexter and I took a little rest. I stretched my back using a hard styrofoam roller ( AKA the torture device), and felt the muscles loosen up and let go. I finished reading the book The Soul of an Octopus by Sy Montgomery and what a treasure of a book it is. This is one that I will definitely read more than once. It was interesting, full of heart, and offered offered fascinating insights into these amazing creatures. I can't wait to revisit the New England Aquarium when I'm back in Boston and see the octopus again in person! Now I'm trying to decide which book I'll start next. 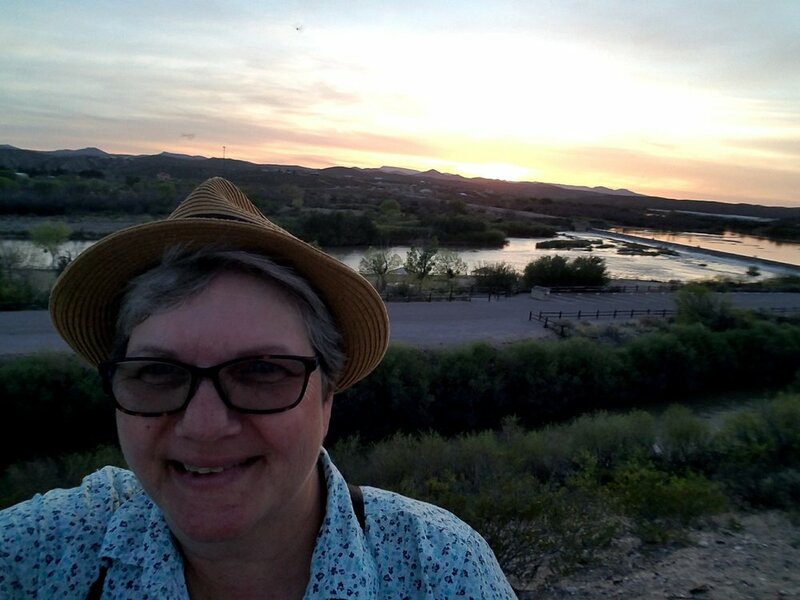 I have three more waiting in the wings that I purchased at the Arizona Sonora Desert Museum: The Hummingbird's Daughter by Luis Alberto Urrea, The Anthropology of Turquoise by Ellen Meloy, and Eating Stone also by Ellen Meloy. I'll keep you posted! I went for another walk late in the afternoon and enjoyed quite a nature show! I saw a beautiful Road Runner with a large branch in his (or her) mouth who must have been scurrying off to build a nest. 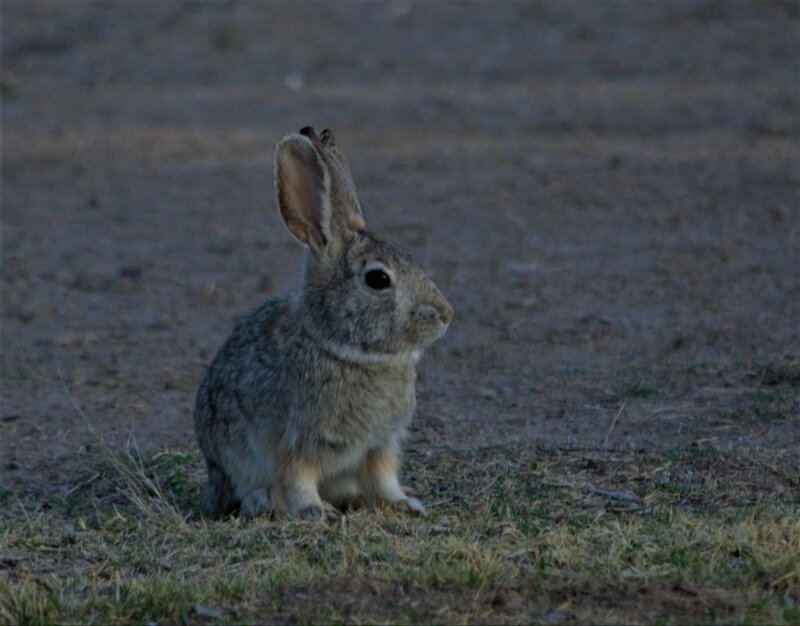 I also saw a nice Jack Rabbit loping along but wasn't able to get a picture of either of these creatures. 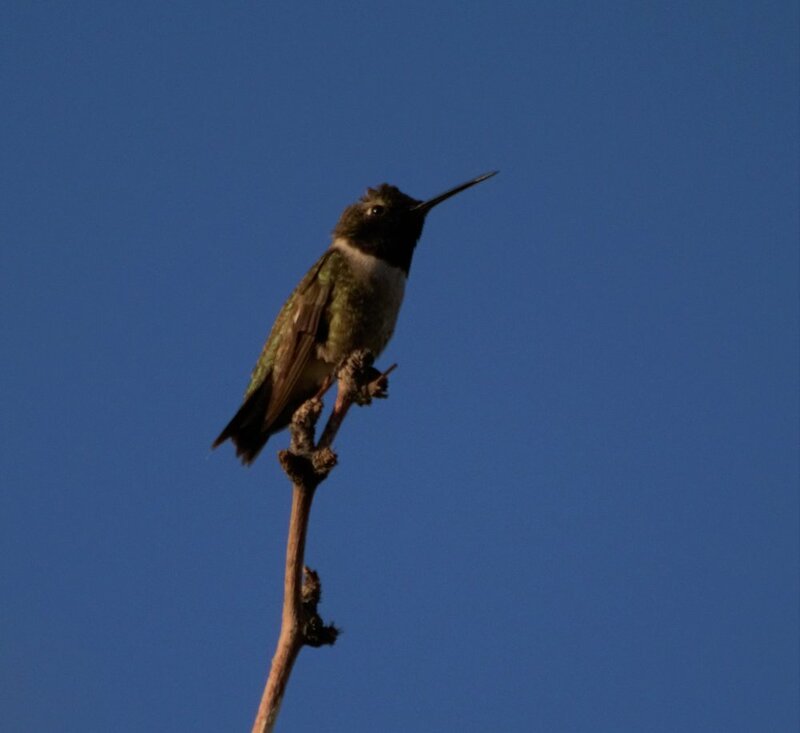 I did however manage to capture a few shots of this little fellow who is perched at the very tippy top of a small tree. 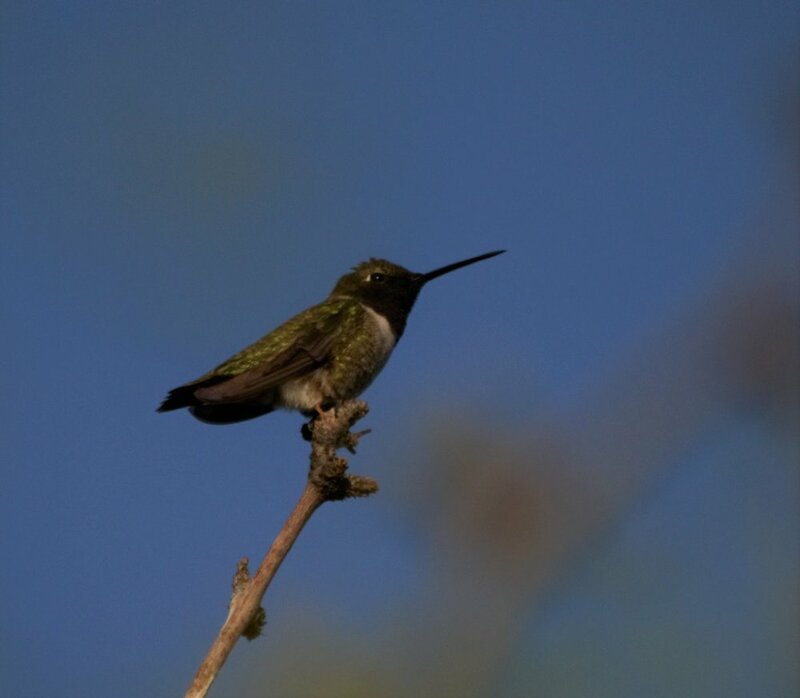 He is a species of hummingbird I have not encountered before called the Black-chinned Hummingbird. Quite a handsome fellow! Next I caught sight of some cottontails out for an early supper. They gave me a curious gaze, and then scampered off into the underbrush. On my way to the river I spotted this Wild Herps Lizard, a White- Winged Dove, and a Yellow-rumped Warbler. Far overhead, as I hiked along, I saw at least 10 different flocks of geese or, more likely, sandhill cranes, flying in loose "v" formations heading north. Their migration reminded me of all the travel trailers I saw leaving the campground heading north back to their homes in Minnesota and Oregon and Washington in the past week. Once April arrived, all the snowbirds began to fly home! I found the river flowing swiftly and filling its banks. Water was spilling over the Leasburg Dam, and the mighty Rio Grande was cutting a beautiful path through the desert floor. Water, especially running water, is such a magnificent sight in the desert. I enjoyed another glorious sunset here at the park. I hope to have a restful night and then will head north myself tomorrow, bound for Santa Fe.